The year was 1783. 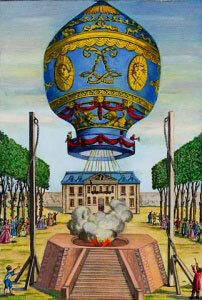 In Annonay, France, brothers Joseph and Etienne Montgolfier (pronounced, "Mon-goal-fee-ay"), papermakers by trade, built the worlds first manned hot air balloon from paper and silk. A fire fueled by straw, wool, and even old shoes created the lifting force. On November 21st of that year, it was launched from the center of Paris and flew for over twenty minutes, piloted by two noblemen, Pilatre de Rozier and the Marquis d'Arlande. The birth of manned flight! The pilots carried along a bottle of champagne to enjoy on the flight, but instead of consuming it, they used it to appease the peasant farmers whose field their flying monster had landed in! The champagne convinced the farmers that they were not demons (in fact they were Frenchmen! ), and the ballooning tradition of presenting landowners with champagne continues to this day, although for slightly different reasons. Soon after the first hot air balloon flight, gas balloons filled with hydrogen and helium took to the skies and gained popularity, being safer and more reliable than flying with an open flame. It wasn't for a long time that hot air balloons came back into interest. Ed Yost launches on a flight into the history books... For him, just another day at work! Fast forward about 180 years - we find ourselves at a remote airfield in Bruning, Nebraska at the height of the Cold War. Raven Industries of Sioux Falls, SD had been commissioned by the U.S. Office of Naval Research to create a flying machine capable of carrying one man in sustained flight for three hours. 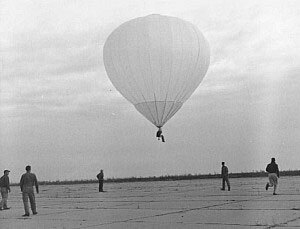 On October 22, 1960, chief pilot and inventor Ed Yost made the first flight in a modern hot air balloon - this time the balloon was made of strong ripstop nylon fabric and powered by propane burners. Thus, the rebirth of hot air! Soon afterwards, the first sport balloons were sold to individuals with a taste for adventure. The sport of modern hot air ballooning exploded in popularity, and other manufacturers sprang up to meet the demand for balloons.